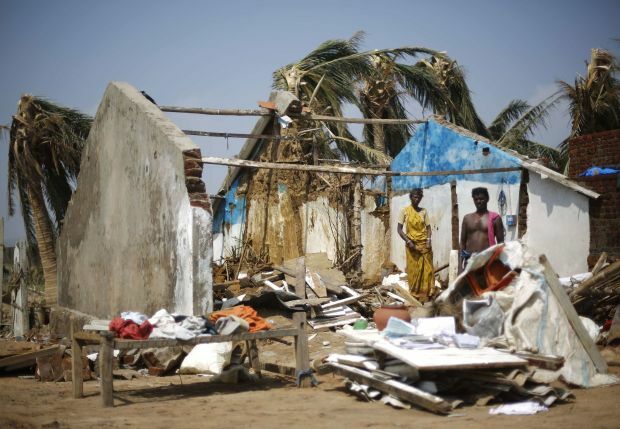 THRISSUR, India (CNS) — Church charities in India are preparing for a massive relief work after Cyclone Phailin left nearly 9 million people affected along the east coast of India. “On the ground, there is total devastation. But, I am glad that the government did an excellent job with the massive evacuation that saved many lives,” said John Shumlansky, country representative in India for the U.S. bishops’ Catholic Relief Service. Shumlansky told Catholic News Service Oct. 15 from eastern Orissa state that “the challenges ahead are too many” with houses blown away, buildings damaged and farms under water. Phailin hit India’s east coast Oct. 12 with winds of up to 120 miles per hour; it devastated the coastal areas of Orissa and Andhra Pradesh states. Only about two dozen people were killed — mostly by falling trees — because nearly 1 million people were evacuated by the government ahead of the cyclone. “The people need to be helped to rebuild their house and lives. Many of them have lost their livelihood,” Shumlansky said after visiting the area where Phailin made landfall; houses had been blown away and roads were littered with broken trees. “We distributed emergency relief (including shelter material) to 180 families today,” he added. CRS’s immediate target, he said, is to reach out to 10,000 families with aid, including cash grants to help them buy essential items. An Orissa state official said more than 14,500 villages in 12 districts were affected, with 234,000 houses damaged in Orissa state. More than 1,200 acres of crops were destroyed by gushing waters. Antony Chetri, relief work coordinator for Caritas India, told CNS that the Caritas network would provide shelter material like tarps for most needy families. “Since the government is already providing food to the displaced people (in more than 1,000 relief camps), we do not want to duplicate it. We will try to identify those in remote areas and help them,” said Chetri. He was speaking from Orissa, where he was held up after angry affected people blocked the road protesting that relief material had not reached their area. “We distributed relief material to 500 families in Ganjam,” he added. Meanwhile, Babita Allick, team leader of the disaster management wing of Caritas India, told CNS that it has released $16,500 for emergency relief and assessment work for the dioceses of Berhampur and Balasore.